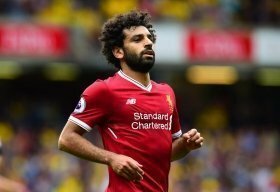 Juventus eyeing shock move for Salah? Juventus are reportedly planning a club-record bid worth 175m to lure Mohamed Salah from the clutches of Liverpool during the summer. The Egyptian has been an absolute revelation since joining the Reds from Roma more than 18 months ago and he has already scored 64 times in 86 games for the Merseyside giants. Owing to this, Jurgen Klopp's side recently rewarded him with a new bumper contract but Sky News Arabia claims that the Bianconeri may still make an ambitious approach for the attacker. It is added that Cristiano Ronaldo is desperate to play alongside Salah in Turin and the Bianconeri may seek to abide to his desire by making a significant £175m bid to test the Reds' resolve. Both Douglas Costa and Paulo Dybala are currently facing uncertain futures with the Bianconeri beyond the ongoing campaign and reports indicate that the duo could make way to enhance the club's transfer kitty for the summer.